This article demonstrates how to issue a SQL SELECT Query from Python application to retrieve MySQL table rows and columns. Execute the Select query and process the result set returned by the SELECT query in Python to retrieve rows from MySQL table. 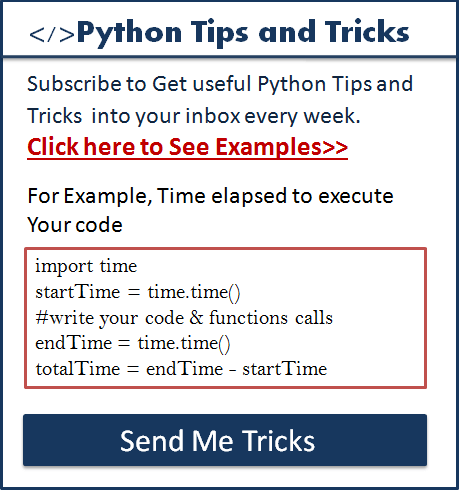 Use Python variables in the Select query to pass dynamic values to query. Use fetchall(), fetchmany() and fetchone() methods of a cursor class to fetch limited rows from a table. Count total rows of a table. Python MySQL SELECT Query example to fetch rows from MySQL table. MySQL database table name from which you want to fetch data. For this article, I am using “python_developers” table present in my MySQL server. 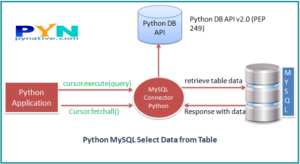 Note: We are using MySQL Connector Python to select data from MySQL table. Establish MySQL database Connection from Python. Define the SELECT statement query. Here you need to know the table, and it’s column details. Execute the SELECT query using the cursor.execute() method. Get resultSet from the cursor object using a cursor.fetchall(). Iterate over the ResultSet and get each row and its column value. Close the Python database connection. In this example, we are fetching all the rows from the python_developers table and copying it into python variables so we can use it in our program. sql_select_Query = "select * from python_developers"
When you execute the above example, you should get the following output. import mysql.connector this line imports the MySQL Connector Python module in your program so you can use the functions of this module to communicate with the MySQL database. Next, We used the mysql.connector.connect() function to connect the MySQL Database from Python. Then, We prepared SQL SELECT query to fetch all rows from a python_developers. This table contains four columns. Next, we used a connection.cursor function to get a cursor object from the connection object. We executed the select operation using a execute() function of a Cursor object. On successful execution of a select query, the execute() method returns a ResultSet object which contains all the rows. After that, We are using a cursor.fetchall() method we can fetch all the records present under a “python_developer” table. In the end, we used for loop to iterate over all the records present under resultset object and printed them one by one. Once all record fetched successfully, we closed the MySQL Cursor object using a cursor.close() and MySQL database connection using the mySQLconnection.close(). Note: To fetch data use cursor.execute() to run a query. cursor.fetchall() to fetch all rows . cursor.fetchone() to fetch single row. cursor.fetchmany(SIZE) to fetch limited rows. 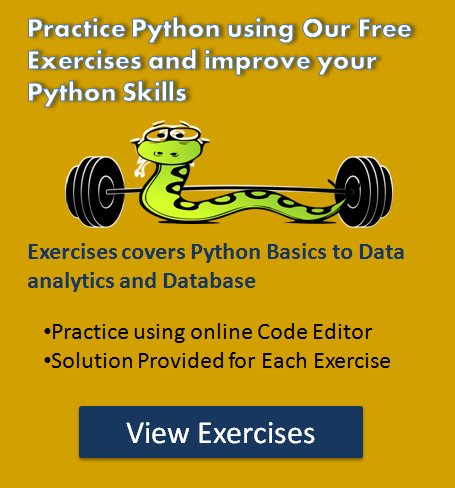 Check out our Python Database Programming Exercise to master the database programming techniques in Python . Many times we need to pass a variable to SQL select query in where clause to check some condition. Let’s say application want to fetch python developer details by giving any developer id at runtime. To handle such requirement we need to use a parameterized query. Let see how to do it. A parameterized query is a query in which placeholders (%s) used for parameters and the parameter values supplied at execution time. You can read the Parameterized Query and its performance benefits. Let see the example now. sql_select_query = """select * from python_developers where id = %s"""
In some situations to fetch all the rows from a table is a time-consuming task if a table contains thousand to rows. If we fetch all rows we need more space and processing time to its advisable to use the fetchmany() method of cursor class to fetch fewer rows. This method fetches the next set of rows of a query result and returns a list of tuples. If no more rows are available, it returns an empty list. Cursor’s fetchmany() methods return the number of rows specified by size argument, defaults value of size argument is one. If the specified size is 5, then it returns Five rows. Note: If a table contains row lesser than specified size then fewer rows are returned. Note:- Also in the above program, the specified the size is 2 to fetch two records. Also, we set buffered=True in connection. Cursor () method to avoid MySQL Unread result error. Use the cursor.fetchone() method to retrieve the next row of a query result set. This method returns a single record or None if no more rows are available. Note: The fetchone() method is internally used by fetchall() and fetchmany() to fetch rows. sql_Query = "select * from python_developers"
Let’s see you want to execute Following SELECT SQL Query and store the table’s column value into a python variable for further processing. However, how to select just the column value 7000 and save it in a variable to do some calculations? You need an employee salary into a variable so you can add 10% on it as a bonus amount. To do this calculation, you can select column value and store it in a python variable. Let see how to do this with an example. sql_Query = "select salary from python_developers where id =%s"
You can see in the above example after fetching a row using a cursor.fetchone() we converted column value to appropriate type using value = float(record). The result set contains columns that we fetched using a select query, here we fetched single column, so we retrieved 0th index value from the result set. Most intresting part for me is input = (2,) — i can`t made my python script doing select queries right… and know what? Yes! It must be used this way in execute: not just a variable (i used UID var for WHERE) but (UID,) and now all works superb. Thank you much! Instead of printing a table I would like to load each column into an array. No examples seem to exist. I guess it’s not possible. Is there any way to compare data between two different databases? Eg: I have 2 different databases and data coming from multiple tables. Here I wanted to compare Source Vs Target. I have created two different connection strings and executed two sqls separately. But, how to compare the two resume sets even though we have huge volume of data. How to compare two or more db result sets in python? This is Murugan . i am new in Database . i bought one windows server on GoDaddy.com . i create database name and table , column etc…..my aim is to access the my own DB . i.e i have one raspberry pi 3 interface with sensors(like Temperature sensor ) that temperature sensor value want to insert into my live DB , ? i tried some code but its shows error : [Cann’t connect the website ..] so pls help me..